Matthijs de Ligt to Barcelona is the biggest transfer story in the Catalan media right now. The Ajax defender has seen his own rumour dwarf that of teammate Frenkie de Jong, and it’s De Ligt who is getting the majority of interest right now. There’s front pages and claims of a deal being possible for the player to arrive at Barcelona soon, either in the winter transfer window or next summer. Playing an important role in that, report Mundo Deportivo, is Mino Raiola. The super agent represents De Ligt and it’s reported he’s playing a ‘fundamental role’ in the potential transfer. Raiola is said to be constantly on the case, communications with the agent are described as ‘fluid’, and he’s expected to use contacts at the Dutch end of the deal to do what he can to help. In July, Raiola visited the Ciutat Esportiva de Sant Joan Despí to hold a meeting with Pep Segura, Eric Abidal and Ramon Planes and this has helped build relations. 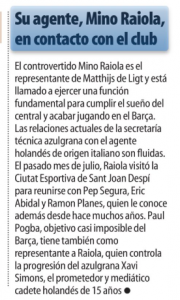 Mundo Deportivo point out Raiola is also Paul Pogba’s agent, although they state that transfer is considered impossible.